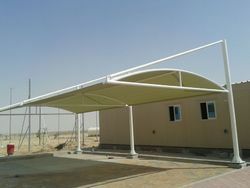 Offering you a complete choice of products which include vehicle parking sheds. With the help of our experienced professionals, we have been able to design and develop an extensive and appreciated range of Vehicle Parking Sheds. These sheds are manufactured using optimum quality raw material, which is sourced from the most respected vendors in the industry. Due to their high quality, these products ensures durability.